At first blush, child support appears simple. The Child Support Guidelines provide a table to determine child support based on the payor’s income and the number of children. Once the parenting schedule is determined, the child support arrangements can be figured out. What is the income of a self-employed person or business owner? Will CRA records be needed to scrutinize income and asset disclosure? Will it be necessary to compare claimed income and lifestyle level to determine income? Should income be imputed? How is income such as commissions, bonuses, stock options, etc. quantified? Are there business expenses and deductions that reduce income for child support purposes? 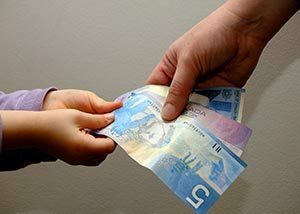 In shared custody situations, there can be a child support obligation of both parents based on their incomes and a broader spectrum of shared expenses. Once the income of the non-primary resident parent is known, the “Child Support Guidelines” chart provides a set figure of monthly payments depending on that income and on the number of children. This is the starting point in the determination. A determination is then made of additional payments which the non-primary residential parent will be obliged to contribute to. These additional payments are for child care and expenses, medical and health-related expenses, extraordinary expenses for primary or secondary school education; expenses for post-secondary education, and extraordinary expenses for extracurricular activities. The amount paid for such add ons (section 7 expenses) is determined on a proportionate basis by comparing the income of each parent. There are exceptions to the above scheme of child support determination. The most common occurs where the non-primary residential parent has the children for more than forty percent (40%) of the time (shared parenting), and offset child support is determined and a larger view of the children’s shared expenses is needed.